TheSporting Globeonce wrote that ‘Jiggy’ was an appropriate nickname for John Harris. “Always on the move, Harris gives one the impression of independence of spirit and movement which makes him a personality”, it said. And a personality he was – cheeky, funny and outgoing. There was even personality in his football, which was based heavily around his trickery and evasiveness. Combined with his size – or lack of it – he became a crowd favourite; the fans loved it when he would trick or twist around an opponent and make him look silly. John Harris (he once explained that he was called ‘Jiggy’ simply because he “kept jigging about”) was born in Mildura, but moved to Brighton when he was a boy. He captained his school team at the age of 11, then joined Brighton Vale in the Senior Cadet competition. At the age of 17 he moved to Brighton in the VFA, playing mostly in the centre or on the wing. Collingwood tried to get him to Victoria Park at the end of 1923, but a succession of clearance wrangles meant it wasn’t until 1925 that he came to Victoria Park – without a clearance. He “failed lamentably” in his debut against Hawthorn at Glenferrie Oval in 1925, but soon became a regular fixture in the team. He played mostly on a wing in his first two seasons, and by the end of 1926 had established himself as a good senior player. “So consistent has his play been that he has rarely bad to lower his colours to an opponent,” wrote the Sporting Globe after the 1926 season ended. “He crowned an excellent season’s work with a splendid performance against Melbourne in the second semi-final when be was one of the outstanding players in the Magpie colours. “His spectacular dashes, and the manner in which he weaves his way through a bunch of players, has caused his opponents many anxious moments. His elusiveness and ability to extricate himself from a dangerous position by a piece of brilliance, or a clever manoeuvre, has proved of wonderful value to the team. Though light and small, he is never afraid to dive into the bunch for the ball, and though often knocked down, comes up smiling for more. Late in 1926, Harris was tried at half-forward. And this proved to be the turning point for Jiggy as a footballer, for he took to the half-forward flank like a duck to water. He formed a great understanding with both centre half-forward Frank Murphy and full-forward Gordon Coventry, and his football smarts and natural evasiveness made him a dangerous small forward. His captain, Syd Coventry, once described Jiggy as “the little corkscrew”. “Twisting about everywhere, Harris sharpens up our ground play, braces up the attack, and is always likely to open up a game with his speed and trickiness,” Coventry said. But for all his on-field trickery and off-field personality, Harris was a serious footballer. 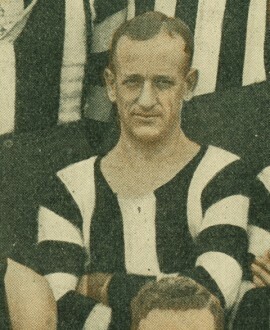 He became a key component of the Premiership sides of 1927 and 1928, and in 1927 was awarded the Austral Cup via popular vote of local theatre patrons for the Magpies’ best player of the season. He also played every game of the 1929 season and looked set for a hat-trick of Premiership medallions. But he was surprisingly dropped for the Grand Final and took it badly – so badly, in fact, that he crossed to Hawthorn as captain-coach. Still, Jiggy’ Harris was Collingwood to the core. He returned to the club after his coaching days (after Hawthorn he also coached at Port Melbourne and Ivanhoe) and remained involved there in a variety of roles – including at board level – until 1978. His extroverted personality translated well into the commercial world and he became a highly successful businessman. He had a great rapport with people, became involved in numerous community organisations and established a charitable trust which continues to provide funds for medical research and treatments, especially in the areas of liver cell transplants and child education programs. He received an Order of Australia for his work in 1979. Through the work of his trust, which has now given over $1 million dollars, he continues to have an impact far beyond the considerable one he made as a Collingwood footballer.